The former Bishop of Rochester’s two sons have been set upon in a racial attack, it has emerged. 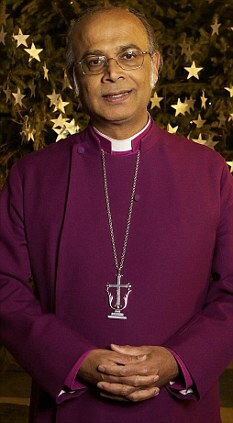 Dr Michael Nazir-Ali, the first Asian bishop appointed by the Church of England, last night condemned the gang assault. Pakistani-born Dr Nazir-Ali, who retired last September, said: ‘Any act of violence is concerning but it makes it even worse that it was racially motivated. ‘My main concern is making sure the boys are OK.
‘I was the Bishop of Rochester for 15 years and we worked hard to make sure there were good relations between everyone – regardless of race – in the area. ‘Unfortunately, town and city centres attract the wrong sort of people these days. His sons Shami and Ross suffered cuts and bruises after being chased from a kebab shop by a 20-strong gang in Rochester, Kent, last Saturday evening. Ross, 30, said: ‘One of them called me “gay” and then others started shouting racist abuse, calling me and my brother “Pakis” and telling us to “get lost”. ‘I’m still shaken up by it – it was so frightening. My mum was really upset by it and our dad was angry. It was horrible. A Kent Police spokesman has confirmed the assault is being treated as racially-motivated. This entry was posted on Sunday, May 9th, 2010 at 6:51 am	and is filed under Uncategorized. You can follow any responses to this entry through the RSS 2.0 feed. You can leave a response, or trackback from your own site.